The sky is blue. The sun is shining. The court is empty. The only thing you’re missing? An outdoor basketball. Most people would agree that nothing can beat a good indoor basketball purely in terms of feel. However, every basketball player will play outside at some point. Outdoor basketball covers are designed to withstand the rougher surfaces and conditions of outdoor play. You won’t have to worry about the ball being ruined by the concrete or acrylic courts you play on. Besides, they can also be played indoors. They are the perfect all-round basketball to own – every player should own one. Composite Leather Or Rubber Cover? When it comes to outdoor basketballs, the biggest consideration is the construction material used for the cover. It would be criminal to play a genuine leather basketball outdoors, so that leaves us with two options: composite leather and rubber. 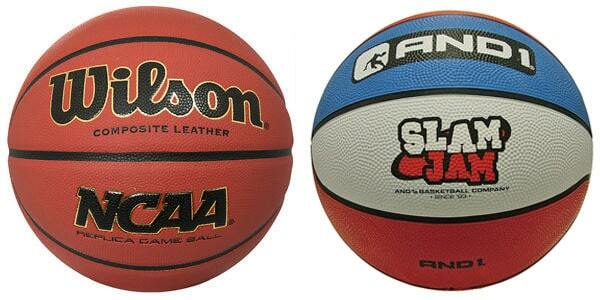 Composite leather basketballs use synthetic leather and feel similar to a genuine leather basketball. Note: Genuine leather basketballs are increasingly expensive and rare. They are barely used outside of NBA and EuroBasket games anymore. The NCAA has been using composite leather for years now. Rubber basketballs are cheaper than composite basketballs, but are noticeably less nice to handle. They feel rubbery and have bigger pebbles on the surface, making them harder to grip. They often go by the name of ‘Street’ basketballs. Can you use a composite leather basketball outside? Certainly! In fact, all the best outdoor basketballs are made from composite leather. Unless you have an incredibly tight budget, avoid a rubber basketball – you can thank me later. However, keep in mind that there are indoor-only composite leather basketballs and indoor/outdoor ones. Unless the basketball explicitly states that it can be played outdoors (sometimes indicated through terms like all surface, multi-court etc. ), avoid taking it outdoors. Indoor-only basketballs are softer and easily damaged on an outdoor court. There is almost always a trade-off between softness and durability – no getting around that. For the average buyer, choosing the right outdoor basketball is difficult and time-consuming. There are an overwhelming number of options and very few have the luxury of trying them all out. Generally speaking, the softer the basketball, the nicer and more grippy it feels in the hands (there is an argument to be made that a basketball can feel too soft). Outdoor basketballs feel harder than indoor basketballs, but new manufacturing methods and composite materials mean the best ones are soft and durable at the same time. The last thing you want is for a basketball to bounce in a way you don’t expect. Some basketballs have an inconsistent bounce that is noticeable among seasoned basketball players. Some basketball manufacturers will state a basketball is suitable for outdoor use, when they really won’t hold up well. Sure, they’ll be perfectly playable for the first few games, but are you prepared to replace it every month? You should expect a life expectancy closer to a year from a good outdoor basketball. Under Armour is relatively new to Basketball but has shown its commitment by snapping up big sponsorship deals with the likes of Stephen Curry. While their history as a ball-manufacturer only dates back a few years, we found the Under Armour 495 Basketball to be a terrific multi-court basketball. So terrific in fact, that we consider it to be the best outdoor basketball right now. The UA Gripskin technology is designed to provide a better grip through denser and deeper pebbling. It also features nylon winding to keep shape and a 100% Butyl rubber bladder to better retain air. The ball was initially a little slippery and difficult to palm. However, after wearing it in for a few days the ball felt softer and had more grip, mimicking the feel of a high-end indoor basketball. Overall, the Under Armour 495 takes the crown as our favorite outdoor basketball. Wilson seem to have got the difficult balancing act of feel and durability spot on with their NCAA Replica Game Basketball. 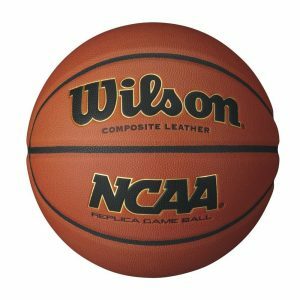 It doesn’t come as a surprise since Wilson produce some of the best composite leather basketballs on the market. Whereas Spalding is known for their genuine leather official NBA basketballs, Wilson are king of composites. They provide schools and colleges with basketballs and produce the official NCAA tournament game ball (also made from composite leather). If you’ve played basketball games in high school, you might know the legendary Wilson Evolution indoor basketball. The Wilson Replica NCAA Game Basketball feels almost as soft and tacky. The difference being, of course, that this basketball’s cover won’t shed to pieces on an asphalt surface! 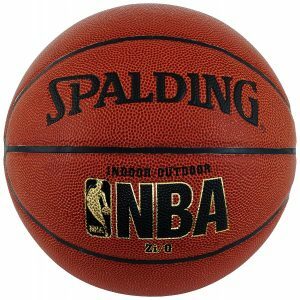 Staying with replica game balls, the Spalding Replica NBA Game ball is another fantastic indoor/outdoor basketball. Compared to the Wilson NCAA replica game basketball, this basketball doesn’t have quite as much grip. More grip is typically a positive, but it really depends on the application. 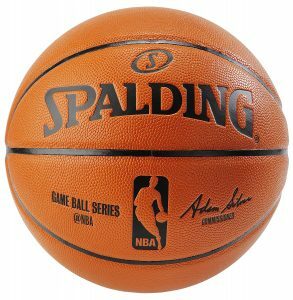 For ball handling and dunking, the Wilson NCAA replica is better, but for shooting and passing, the Spalding Replica NBA Game Ball edges it out. Unfortunately, this basketball suffers from some quality control issues around the seams. Owing to the superior panel seam construction, we reckon the Wilson basketball is a better purchase overall. 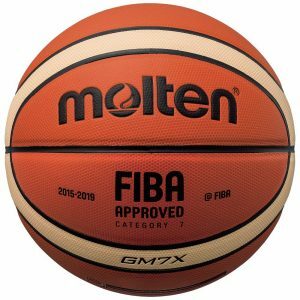 Molten is a successful Japanese sports equipment brand who are famous for being the ball supplier for FIBA worldwide competitions (including the Olympics). The Molten GM7X is made to the same specification as their tournament ball, but with a harder wearing outdoor cover. Molten’s X-Series basketballs feature an iconic 12-panel design that distinguishes itself from the traditional 8-panel design. Its seams (channels) are noticeably shallower than other basketball brands, but there are also more of them. In terms of feel, Molten has a great feel that’s difficult to describe. It feels different compared to the Spalding/Wilson balls that many players are comfortable with, but not in a bad way. It doesn’t feel as leathery and feels like a super-soft, cushy kind of rubber. The ball’s aligned pebble pattern that provides consistency across the basketball’s surface is a particularly interesting feature. It might be unnecessary, but it’s a nice little detail nevertheless. Durability wise, there are some questions hanging over the GM7X. It doesn’t seem to hold up quite as well as the others. It’s therefore not recommended for players who play exclusively outdoors. We definitely recommend trying out the Molten GM7X if you get the chance. Some people love its unique design and feel, others aren’t so fond. The Zi/O Basketball is Spalding’s attempt at creating the ultimate indoor/outdoor hybrid basketball. It’s tight pebbling gives it a soft and tacky feel. Meanwhile, it’s foam-backed cover ever so slightly dampens the bounce on harder outdoor surfaces. As a result, it doesn’t feel too bouncy on harder outdoor surfaces. If you value consistency across playing on hardwood (indoor) and concrete (outdoor) surfaces, the Zi/O is a good choice. While consistent across all surfaces, the bounce itself unfortunately feels a little dull to begin with. While the basketball feels good in the hands, the Spalding NBA Replica Game Ball has superior touch and bounce characteristics overall. The Zi/O Basketball is being phased out, and we would only suggest getting this basketball over the Spalding Replica NBA Game Ball if it’s significantly cheaper. 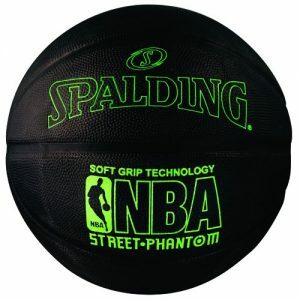 The Spalding NBA Street Phantom Outdoor Basketball is the the only rubber basketball on this page. Since it’s rubber-made, it will last forever. However, rubber basketballs feel cheap and no serious player wants to use one unless there’s no other choice. This basketball features Spalding’s rubber soft grip technology, designed to do the impossible – make a rubber basketball feel soft. The basketball feels miles better than your discount store rubber basketball as a result. The seams are also wider than normal, but being a rubber basketball you don’t really notice them. It’s a good basketball to have just in case you ever want to play some ball an uneven, dirty surface. Or just to use as a secondary basketball in order to increase the longevity of your main basketball. It’s the best rubber basketball you can get – just don’t expect the same touch or bounce as a composite basketball. Nike are synonymous with basketball. However, that’s mostly down to their basketball kits and shoes, not so much their basketballs. Their basketballs are rarely represented in competitive basketball. That’s partly down to their somewhat lackluster basketballs so far which often feel too firm. 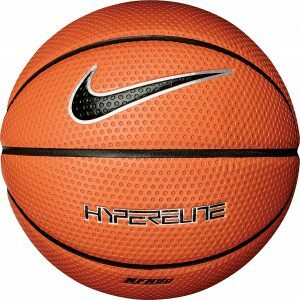 However, the Nike 2018 Hyper Elite basketball is a seriously nice basketball with some nice innovation to boot. It features a unique blended composite/rubber cover that gives it a very nice feel. It’s definitely the softest ball here and has tons of grip. Instead of featuring a pebbled surface like your typical basketball, the Hyper Elite features dimples. This makes it a great choice for those with sweaty hands as moisture escapes easily. Although we loved the Hyper Elite in our hands, it doesn’t have the characteristics of a great outdoor basketball. As soon as you pick it up you can tell it won’t hold up too well outdoors. It’s somewhat surprising Nike market this as an indoor and outdoor basketball. 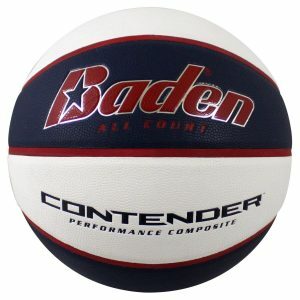 A very popular outdoor basketball, the Baden Contender often comes recommended by others. Its main selling point is its value. It has a lower MSRP than all the other basketballs here (excluding the Spalding rubber NBA Street Phantom). The firm feel and slightly flat bounce let it down, in our opinion. It’s decent for outdoor play but feels funky indoors. Because Amazon runs discounts on our top 5 picks, the Baden Contender doesn’t actually provide any cost saving. As a result, we’d only suggest this if you can snag it for $20 or less. For a decent synthetic leather outdoor basketball, you will generally spend in the region of $30-$40. Rubber basketballs should cost no more than $20. For men and boys 15 years or older, Size 7 is the regulation ball size. It has a circumference of 29.5 inches. For women’s basketball, and boys 12-14, Size 6 is the official size. The circumference of a size 6 ball is 28.5 inches. For youth basketball (ages 11 and under), Size 5 is the standard. Size 5 balls have a circumference of 27.5 inches. The weight of the basketball should be in line with the NBA/FIBA specifications. All the basketballs listed here, and most basketballs from reputable brands, follow these standards. Just be careful about those cheaper discount store basketballs which usually don’t abide by them. After all, you don’t want to be shooting hoops with a basketball that doesn’t weigh the same as a regulation ball. The synthetic material used in the basketball’s cover determines the ball’s texture. It is a matter of preference and varies from ball to ball. Wilson are traditionally known for making basketballs that are easier to grip/palm, while Spalding basketballs are slightly less so. Being outdoor basketballs, the ball will always be on the firmer side. Outdoor basketballs are designed to be able to withstand rougher surfaces and different weather conditions. However, even the best ones will wear down sooner or later. The pebbles on the basketball will become shallower and the grip will degrade. Despite being manufactured with longevity in mind, outdoor basketballs will generally not last as long as an indoor basketball that is played on a smooth hardwood court. They will need replacing every now and then, so don’t get too hung up on which basketball is toughest. Unlike genuine leather basketballs, composite leather and rubber basketballs are designed to be suitable for play from the get-go. However, most people would agree that even a composite basketball needs some time to feel it’s best. That’s why you can’t really make judgments based off how a brand new basketball feels. 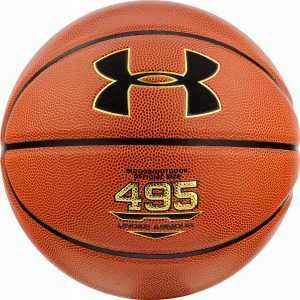 The Under Armour 495 basketball, for example, needs a few hours on court before it feels best. Most basketballs come partially inflated, but you will want to use a ball pump to increase the air pressure to the recommended 7-9 PSI.